The People’s Climate March is this Saturday, April 29th, and thousands are expected to join forces in cities around the world to voice urgency in the fight against climate change, but also in support of social movements, to create environmentally sustainable jobs and cleaner communities. Now, Donald Trump as President has vowed to restore many lost jobs in the coal and manufacturing sectors, but industry experts and economists say that this is highly unlikely. Basav joins us today from Washington, D.C. Thank you so much for being here. BASAV SEN:	Thank you for having me on your show. KIM BROWN:	So, Basav, your report makes the case that investing in cleaner energy technologies can simultaneously bring jobs to all socioeconomic levels, plus reduce the amount of greenhouse gas emissions, thereby improving the environment as a whole. And you reference renewable portfolio standards, otherwise known as RPS. Can you please explain to us what RPS is and the role that it could play in an environmentally sustainable economy? BASAV SEN:	Absolutely. What the renewal portfolio standard is, it is a mandatory timetable for utilities in a state to get more and more of their electricity from renewable sources, such as wind and solar and geothermal. And through a renewable portfolio standard, you of course, both expand the amount of renewable energy powering your grid, and therefore reduce the greenhouse gas emissions –- and you create green jobs. You create jobs in wind and solar. But, there is also a third benefit you can get from renewables, by expanding access to renewables for low-income households and for renters, and for other historically excluded populations, through things that are known by different names. They are called shared solar or community solar. And the third benefit is direct financial benefit for low-income households, who are going to see reduced energy bills as a result of solar energy. So, you have benefits all around: environmental benefits, benefits for low-income households as consumers, and benefits for low-income people as workers. KIM BROWN:	Basav, in your report, it notes that there are 29 states, plus the District of Columbia, that have these RPS requirements. Legislatively, and from a policy perspective, what does this look like? Give us an example of an RPS standard requirement in a state that, in your opinion, is working very well. BASAV SEN:	Yes. A good example is Hawaii, which has the most ambitious RPS in the country. They are set to obtain 100% of their power from renewables by 2045. And the reason they were even able to enact that expansion last year, is because they had met their previous target. So, clearly, they had a lot of room for expansion. And there are excellent RPS standards in many other states across the country. Right here in the District of Columbia, we have a standard to get 50% of our power from renewables by 2032, and simultaneously to bring the benefits of distributed solar energy to 100,000 low-income households. You know, low-income people’s organizations, organized labour, faith communities, indigenous people, people of color –- everyone came together under the Renew Oregon coalition to win this amazing legislative victory. KIM BROWN:	Basav, your report also says, quote, “Expanding shared solar access advances justice and equity”. As we know, when it comes to environmental justice or environmental injustice, as it were, communities of color are often referred to as frontline communities. Think Flint, Michigan, the Standing Rock Sioux Reservation tribe in North Dakota, East Chicago, Illinois, where these predominantly communities of color, are the first ones to feel the effect of either environmental contamination, or climate change as a whole, and of course there are countless others across the country. Explain to us how RPS can improve justice and equity for these communities. BASAV SEN:	Absolutely. Here are communities who bear the brunt of the extractive fossil fuel economy. They are the ones who are most threatened by rising waters, witness what happened after Hurricane Katrina in New Orleans. They are the ones who breath in the toxic fumes, witness the asthma rates in Ward 7 and Ward 8, which are the poor, predominantly black areas of Washington, D.C.
And they are also the ones losing their land and often even their spiritual heritage to fossil fuel extraction and transportation, witness what’s happened to the Standing Rock nation. Everywhere we turn, we see that communities of color are first in the firing line from the polluting extractive fossil fuel economy. So, we have to make sure that communities of color are first in line to benefit from the growing renewable energy economy, and that’s why we need to expand renewable energy, so that communities of color face less pollution from fossil fuels. While at the same time, we have to expand policies, such as shared solar, so that communities of color who are more likely to be poor, and more likely to be renters, can benefit from distributed solar. Because putting solar panels on your roof is great, but if it’s accessible only to high-income people, only to white people, only to people who can own their homes, then what’s the point? KIM BROWN:	Well, let’s talk about that. 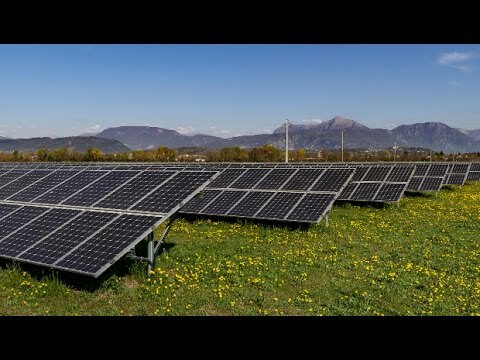 Because as your report references, the need for jobs in these sectors is increasingly becoming more in demand, and as you just said, for example, if a resident is not able to purchase solar panels, maybe that resident could possibly be trained in how to install solar panels, and thereby having a job in the green economy. And there was a story that headlined the New York Times on Tuesday morning, and it read, “Today’s energy jobs are in solar, not in coal”, and the accompanying graphic reads, “1.9 million jobs were created in the energy sector in 2016, the fewest as you see being in the coal industry, with jobs in solar, more than doubling the coal figure”, and natural gas sort of leading the way there. Basav, this sort of dovetails with your report, talk to us about the need for creating jobs in the green economy. But also making them accessible, so lower income people can benefit and have a sustainable income. BASAV SEN:	That’s exactly right. If you look at the President’s rhetoric around bringing back coal jobs, he is either deluded, or lying, or both. If you look at coal jobs today, there are about 160,000 coal jobs that are attributable to electricity generation, and 374,000 solar jobs –- so more than twice this number. And yet, coal accounts for 26% of the electricity grid, and solar accounts for only 2%. So, at a much smaller contribution to the grid, solar already produces more than twice as many jobs as coal. Imagine how many jobs we could create in this economy, and jobs, as we know are sorely needed. If we were to really ramp up solar and make it a much bigger part of our grid. A rational government should be putting its resources, and its muscle, into growing solar energy and growing wind energy instead of trying to bring back coal — if the government is serious about creating jobs –- and we have to make sure that both historically excluded populations, such as people of color and low income people. And former fossil fuel workers, are first in line to get these new green economy jobs, and to get the training for these green economy jobs, because remember that fossil fuel workers are yet another population who did not create the climate crisis in the first place. They are just workers in a capitalist economy, who obtained the jobs that they could. And they are not the ones who really benefited from the economy, either. In fact, in the case of coal miners, they ended with miner’s lung disease from risking their lives going down those shafts, while it is those big coal companies who are the ones who profited from their labour. So, the populations we have to particularly ensure get these new green economy jobs are people of color, low-income people and former fossil fuel economy workers. And there are promising initiatives in that direction. I’ve pointed out how California’s program for installation of solar panels on low-income homes also emphasizes job creation, and job access, for traditionally excluded populations. KIM BROWN:	Indeed. It is a very compelling read. I encourage you to check out the link to the report that’s going to be right under this interview. We have been speaking with Basav Sen. He is the director of Climate Policy Project at the Institute for Policy Studies. He’s been on the line with us today from Washington, D.C., and you should check out his report from the Institute for Policy Studies. It’s titled, “How States Can Boost Renewables with Benefits for All: Renewable Portfolio Standards” –- remember that –- RPS –- and distributed solar access for low-income households. Basav, we appreciate you joining us today. Thank you. BASAV SEN:	Thanks a lot, and thanks for having me on the show, and I can, if I have a minute, I can quickly talk about an event we are doing on Friday. KIM BROWN:	Absolutely. Go ahead. BASAV SEN:	The evening before the People’s Climate March at 6:30 p.m. on Friday, April 28th, the Institute for Policy Studies, along with some allies, is holding an event called, “Challenging the U.S. War on the Atmosphere: How States and Cities Can Fight Back”, and we are characterizing the Trump administration’s climate policies as a war, because it is a war on the atmosphere, as well as on frontline communities, communities of color, low income people, people who are hurt the most by climate change. And in this panel we will talk about different things you can do in your communities, in your cities and states, after you go back from the march, because there is a lot we can still do to fight climate change in a just manner in our states and cities. And so that’s 6:30 p.m. on Friday, April 28th, in St. Stephen’s Church, 16th and Newton Street Northwest in Washington, D.C.
KIM BROWN:	Absolutely. And we’ll get a link from the Institute for Policy Studies and put that underneath our interview. So, everyone who is tuning into The Real News and attending the global climate march on Saturday can take part in these extracurricular events surrounding this huge event happening on Saturday. Basav, we appreciate you speaking with us, again. BASAV SEN:	And thanks a lot for having me on the show. KIM BROWN:	You’re very welcome. And thank you for watching The Real News Network.